I’ve been craving art projects since the boys arrived. When they were about 20 months old, I loaded them up in their wagon, wheeled them down to CVS and bought crayons and paper. We got home, set up shop on the front porch, and they chewed on the crayons. 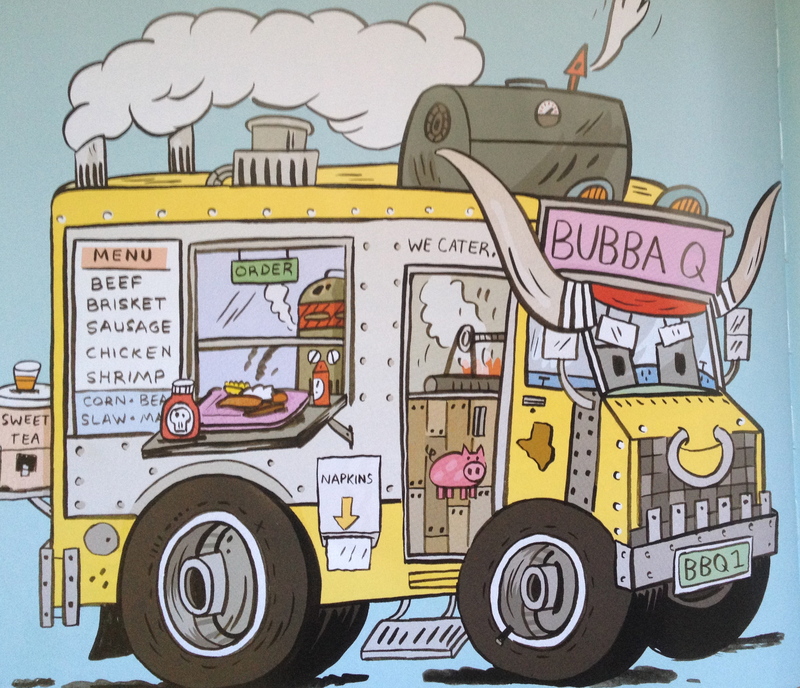 Mark Todd’s Bubba Q truck in Food Trucks! Now they like art and crafts but not always when I suggest/demand/beg to do it. You know when you daydream about something but the reality is different? That’s parenting. In my fantasy life, it was making pancakes on the weekends, cuddling, reading books, and making art. These things do happen but in between a lot of crying, whining, gross things having to do with the bathroom, and fights. And I’m just talking about myself. You can imagine my delight when Food Trucks! by Mark Todd inspired an art project. My boys got it at the library, finding it an awesome combination of transportation, food, and signs. We talked about the food trucks we visited during our Michigan vacation. (Petoskey/Walloon Lake/Paradise) Then we discussed how Dada loved barbeque. This evolved into a lovely Saturday morning, “let’s make a craft in our PJs” event. Using a superhero shoebox, we made a barbeque truck. 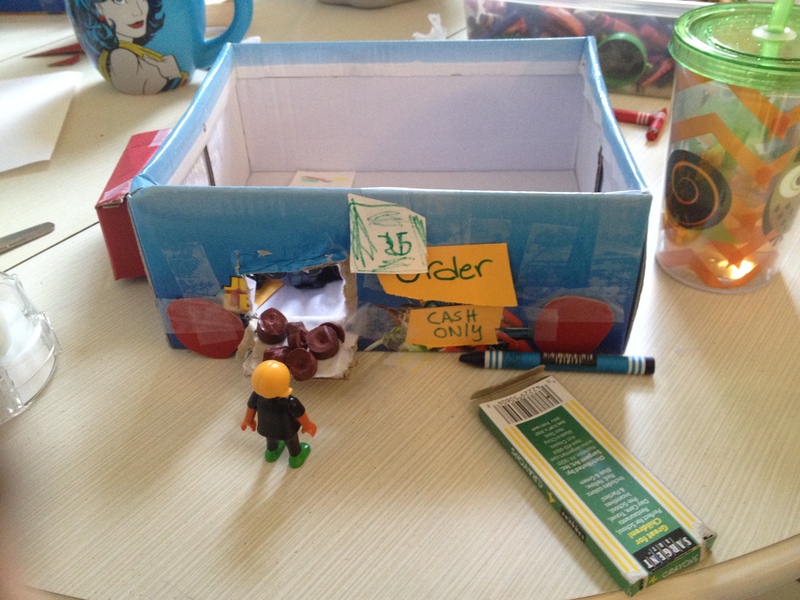 Calvin was in charge of the signs – open, order, cash only, pick up – Max got out the superheroes for workers. 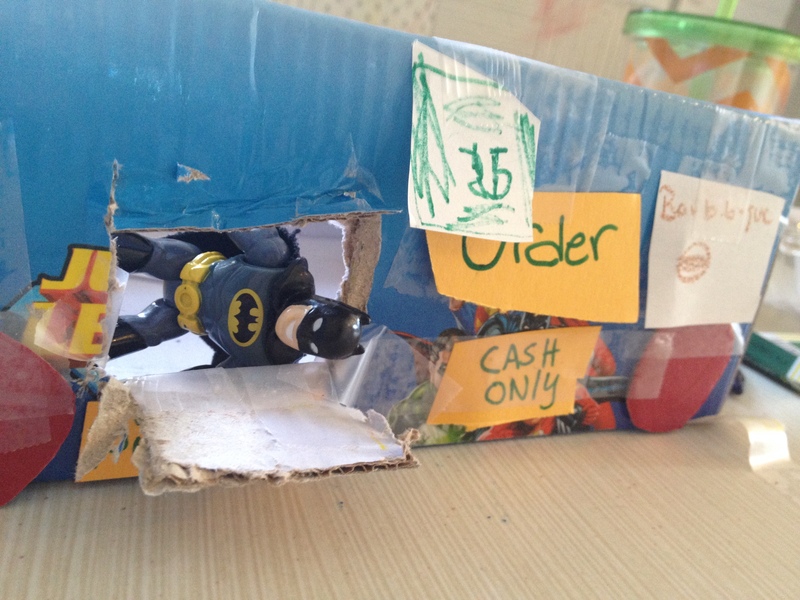 Check it out – Batman is working it. Of course they fought over the ownership of the truck later. And there was a skirmish among the workers. Superheroes and Lego people can’t work together. I guess it’s a different union. This customer is getting impatient. We got our copy at the Clifton Branch of The Public Library of Cincinnati and Hamilton County. Cincinnati bookseller Joseph-Beth sells it. Powell’s City of Books sells it. Mark Todd sells it and other cool books on his website. Try Cincinnati bookseller Blue Manatee Children’s books and decafe. This is my first post. Find out more about me in the About section of this blog. I look forward to more, Julia! Cute, funny and well written. Can’t wait for the next one! Nice job! I like your new blog! I’ll look forward to reading about the boys’ and your reading explorations. Great start, Julia! Very fun! Love it girl! Superheroes and lego people…Ha!